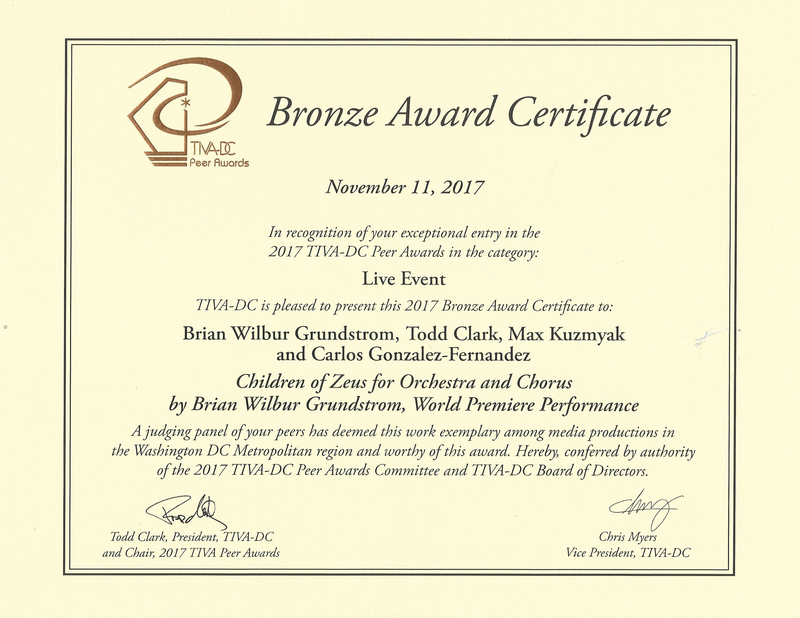 Children of Zeus receives Bronze and Gold at the 2017 TIVA Peer Awards. 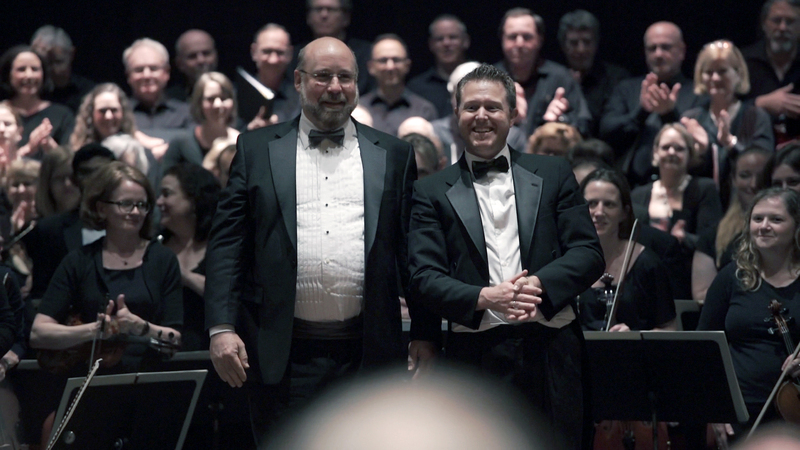 Brian Wilbur Grundstrom with Maestro Jeffrey Dokken, who commissioned and conducted Children of Zeus. We had an amazing concert of Children of Zeus in Wilmington, Delaware on April 29th with CoroAllegro and The Symphony Orchestra of Northern Virginia, conducted by Maestro Jeffrey Sean Dokken. I have created a “Making of” video for Children of Zeus because I want to convey the excitement around this world premiere. Watch excerpts of the piece and what people involved have to say. For those of you in the Washington DC area, you haven’t missed the opportunity to see the work first hand. The second concert is at the Masonic Temple in Alexandria on Saturday, June 3rd at 7pm, and the third and final concert is on Sunday June 4 in Great Mills, MD. St. Maries Choral Arts, the third commissioning ensemble, is joining CoroAllegro and SONOVA for both of these concerts to form a huge chorus to sing along with the 58 piece orchestra. In addition to the video, more information and links for tickets are at www.brianwilbur.com. Hope to see you there! If you aren’t nearby, you can still enjoy the video! Pianist Guy Livingston, who has played my Hoedown in Sixty Seconds for his One Minute More concert program with tailored made films, has included my Contentment, Poem for Orchestra from my CD An Orchestral Journey, along with composers Steve Reich, Paul Bowles, Terry Riley, Gene Pritsker, Alan Hovaness, Timo Andres, William Bolcom and Kurt Weill in his radio program! Thank you Guy! Suite for Chamber Orchestra is featured on Croatian National Radio tomorrow! 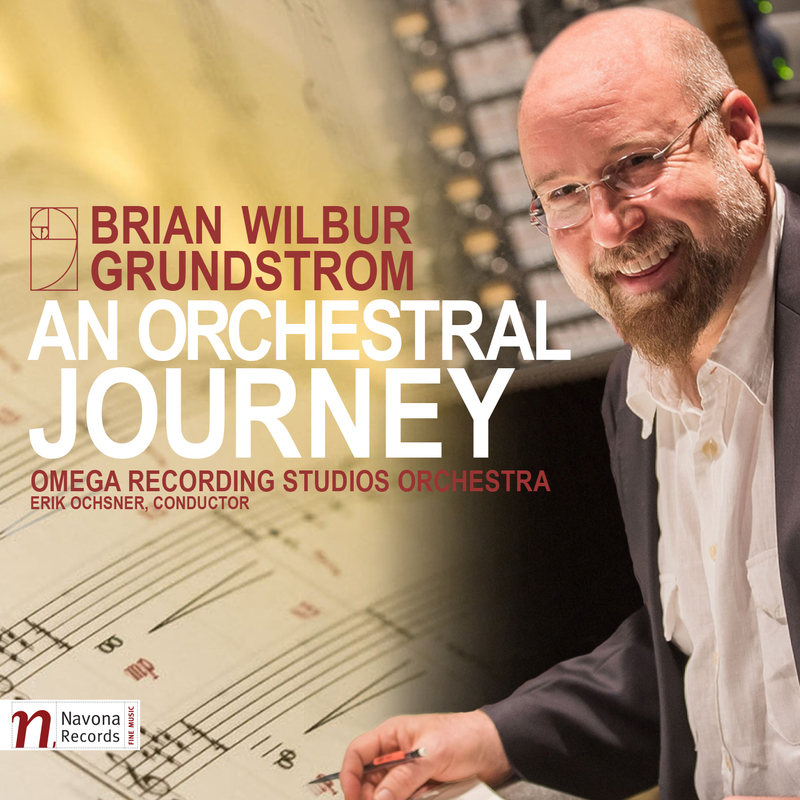 Brian Wilbur Grundstrom’s “An Orchestral Journey” CD gets rave reviews! One interesting fact about this album, though, is that the Omega Recording Studios is an educational and audio engineering facility and Grundstrom had assembled this group, led by the fine Erik Ochsner, specifically to record these works. This really isn’t a standing ensemble. It should be noted, too, that – actually – American Reflections for strings and harp is presented here in a recording by the Millennium Orchestra under Robert Ian Winstin. 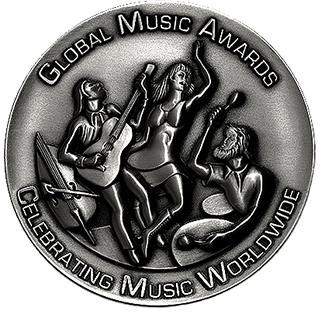 There is certainly enough appeal in these works to hope that Grundstrom will get some wider actual programming and not have to assemble his own ad hoc group to get his music played. If the five compositions featured on An Orchestral Journey are representative of Brian Wilbur Grundstrom’s work—and it’s a safe bet they are, given that they span the years 1999 to 2013—no one will mistake a piece by him for one by Webern or Boulez. Grundstrom, in fact, has more in common with a composer like Berlioz, Holst, or Copland than someone beholden to a particular school or system such as serialism or minimalism. Yet, interestingly enough, Grundstrom’s adherence to a traditional tonal style makes him something of a radical in 2016: composing music that’s so accessible constitutes some small act of rebellion, though it’s important to emphasize that there’s no hint of calculation or cynicism in play; on the contrary, one comes away from the recording fully convinced of Grundstrom’s sincerity. 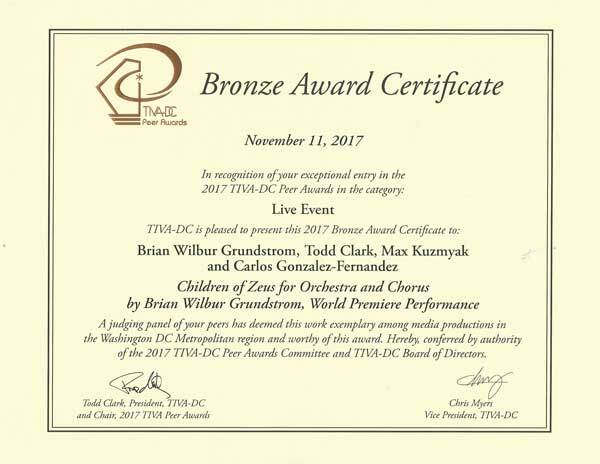 A versatile and awardwinning composer, he’s written for orchestra, opera, film, theater, chorus, and chamber ensembles, and is currently writing an opera based on Hemingway’s For Whom the Bell Tolls. His first orchestra work, 1999’s Contentment, Poem for Orchestra memorably captures the melodic and lyrical dimensions of his style, the setting using the conventions of the “tone poem” to explore an abundance of orchestral colour and emotional expressiveness. For eleven minutes, the music flows elegantly, the composer drawing on the polyphonic potential of the orchestra’s string, woodwind, and horn sections to paint the scene. As symphonically rich, Jubilation! Dance for Orchestra is suitably celebratory in spirit and rhythmic in design, with this time the resources of the percussion section exploited to accentuate the music’s insistent drive. The combination of pizzicato strings and harp give 2009’s American Reflections for Strings and Harp an appealingly lighthearted buoyancy during its opening minutes, even if darker shades gradually thread their way into the composition via an ominous waltz theme. The most recent work, 2013’s Chenonceau is named after a castle in France’s Loire Valley that’s known for the beauty of its gardens, and Grundstrom’s arrangement vividly conveys the visual splendour of the setting. In contrast to the brooding portraits of composers typically presented, the photographs on the release’s packaging show Grundstrom beaming, and it’s easy to understand why. An Orchestral Journey is a recording that not only speaks powerfully of his gifts as a composer and orchestrator, it offers a splendid portrait drawn from fourteen years of creative production. That his music is so easy to warm up to certainly adds to its appeal. The Suite for Chamber Orchestra has three movements: Before The Fall; Avalon; and Celebration! The references are to 9/11 and the collapse of the ‘twin towers,’ as well as the last days of summer; King Arthur’s island of healing; and the manner persevering humans emerge from calamity and set-back. Thus, the dark and foreboding first section continues at the start of the second, with bass and cello notes rising and falling as a sad heart-beat. The battle-wounded and weary seek shelter and refuge. The tempo accelerates with heavy beats to a tense feverish climax and slow exhale and return to cellos and basses. Time heals and time softens memories; woodwinds now sparkle and the orchestra propels forward with rich harmonies, but the celebration comes not with brass flourishes (orchestration requires only one French horn) but with repetition and brightness of strings, flute, and clarinet. 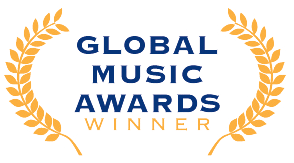 Because Grundstrom earned his music degree at Gettysburg College, American history and Americana smoothly entered and infused his American Reflections for Strings and Harp. Neither Sousa nor Copland in outlook, the piece begins with the joyous spirit of a barnyard dance, but then a Shindler’s List-like folk melody enters and the mood shifts to shadows in waltz time. 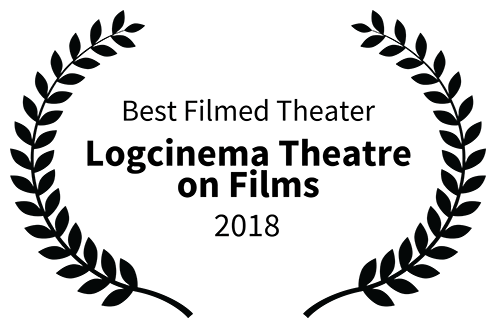 After a second’s pause, the worrisome atmosphere fills with fragmented clouds and an East European lament, but suddenly a Scandinavian-like dance develops, and the piece concludes as it began, light and alit. 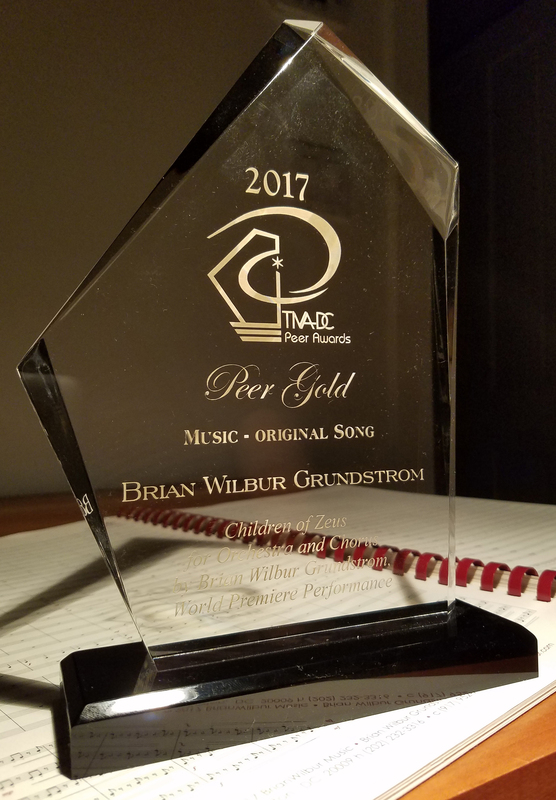 Brian Wilbur Grundstrom, who trained as a pianist at Gettysburg College and studied composition with John David Earnest, composed melodic music, nice, sensitive and very close. The listeners are hooked immediately. He says clearly understand what is the essence of tonality, the ratio of tonic and dominant. And these essentials guide its composition. He has written music for orchestra, opera, cinema, theater, choir, piano and chamber ensembles.In this charming album, which is entitled An Orchestral Journey, the author includes five orchestral works: the author includes five orchestral works: Contentment , Poem for Orchestra ; Jubilation! Dance for Orchestra , Suite for Chamber Orchestra , American Reflections and Chenonceau. The works are arranged chronologically. que entén és l’essència de la tonalitat, la relació de tònica i dominant. I aquests elements essencials guien la seva composició. Ha escrit música per a orquestra, òpera, cinema, teatre, cor, piano i conjunts de cambra. En aquest disc encantador, que té per títol An Orchestral Journey, l’autor inclou cinc obres orquestrals: l’autor inclou cinc obres orquestrals: Contentment, Poem for Orchestra; Jubilation! Dance for Orchestra; Suite for Chamber Orchestra; American Reflections i Chenonceau. Les obres estan ordenades cronològicament. 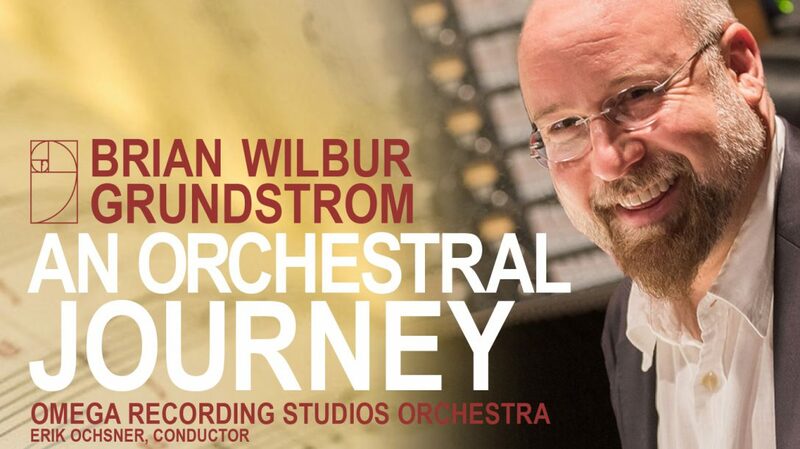 An Orchestral Journey CD is released!